Available in both half-facepiece and full-facepiece configurations, 6000 Series Respirators provide versatility with comfort and ease of use. 3M Occupational Health & Environmental Safetyn both half-facepiece and full-facepiece configurations, 6000 Series Respirators provide versatility with comfort and ease of use. 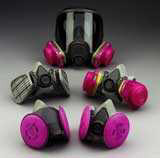 The low maintenance design of the respirators requires only limited maintenance time. Just clean as directed between use and reduce the need for expensive repair programs. The facepieces are approved for use with a wide range of easily fitted cartridges and filters for particulate or gas and vapor protection. They also are approved for use in positive pressure, dual airline applications. These respirators offer users an effective way of meeting OSHA requirements. Depending on the workplace application, the company has a respirator with innovative features and technologies that workers will wear.